Lately the Magic Finance community has been going bananas for Commanders. 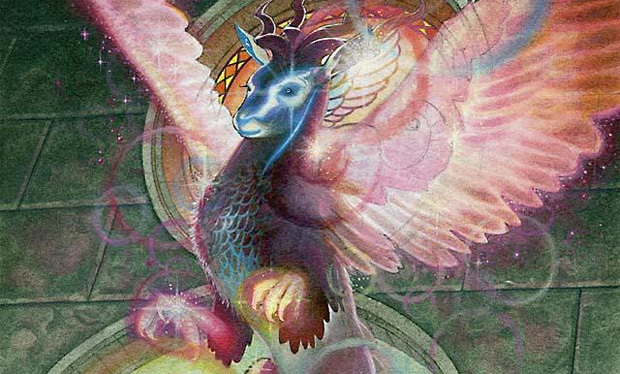 The legendary creatures from Commander and Planechase decks have been making their rounds. It is possible that now interesting legends from Kamigawa are getting some attention. Shirei has been a pet favorite card of mine for a while. The possibilities of getting back small creatures like Bone Shredder or Fume Spitter over and over again are a lot of fun. It is exactly the kind of challenge Commander players love to find and build around. However there is a new 1 power black creature in town. Shadowborn Apostle turns this commander from interesting to degenerate. Imagine getting a new beefy demon every single turn. Shirei makes paying upkeep costs like Abhorrent Overlord’s or Xathrid Demon’s into a value proposition. Lord of the Void and Rune-Scarred Demon are all cheap and fun to play with. He only has one printing and given his name he will be tough to reprint outside of supplemental products. I agree that his time has come. I expect him to continue to climb. Cephalid Coliseum plays in Legacy Dredge. It does fantastic things in that deck like stocking your hand and graveyard at a reasonable price. The problem is that is it an uncommon from Odyssey and it was reprinted in From the Vault: Realms. It was nearly $4 before dipping back down to $2. It looks like it is on its way back up. You should be able to pick up a play set fairly cheaply and sit on them. Tendo Ice Bridge comes into play untapped and provides you with any color that you want. The drawback is that it can only do this once. The Modern Amulet of Vigor deck has found a way around this. It runs so many Ravnica bouncelands that it can rebuy the charge counter over and over again. Azusa, Lost but Seeking even helps you replay and reuse the same bridge on the same turn. It is a rare from Betrayers of Kamigawa so there is not a large supply. The deck uses three of them. The buy in is cheap and I do not believe it is done growing. The deck is still on the fringe but it has seen some 3-1s on MODO Modern dailies. I would trade for any that you see. This common comes to us all the way from Arabian Nights. It is a black Oblivion Ring that returns auras and counters. That makes it a template that Wizards will never want to reprint again. It is also in a color that no longer gets this effect. Why exile a creature when you can Murder them for the exact same price? It is not on the reserved list but it might as well be. I don’t think we will ever see any more copies of this card in existence. It is used in Mono-Black Control Pauper decks but the Pauper format. Unfortunately Pauper is not really a supported format in paper Magic. In Commander and Cubes it gives black an ability that cannot be found on other cards unless you look at creatures like Faceless Butcher. The past few months have seen it go from $2 to $4 to $14. It went back down to $7 and is now on the rise again. I think this is premature. Chandra Nalaar is one of the Lorwyn five. As one of the original planeswalkers she will always have some casual appeal. She also makes some appearances on the competitive front. There is a Modern Boros Lockdown deck that ties up the opponent’s board with Ghostly Prison and Ensnaring Bridge. Chandra Nalaar can pick off small creatures or creates a clock for the opponent. The big finisher is Assemble the Legion. Turn after turn an army of 1/1 soldiers with haste provide chump blockers and eventually an overwhelming offense. Chandra is used as a 2 of in the deck. It is notable that this price is for the Duel Deck: Chandra versus Jace version. It has unique artwork and was only found in limited supplies. I don’t see her rising in price too much more. She has already been printed four times and she could theoretically be reprinted in any core set that needed her. Orzhov Pontiff is a rare from Guildpact. It has not been reprinted and its flavor makes it difficult to reprint outside of Return to Return to Ravnica or a supplemental product. I think even those are long shots as Wizards has expressed regret with the Haunt mechanic. It does some wonderful work in Melira Pod acting as removal and additional value when you sacrifice creatures. It is only played as a one of in the deck. This has helped push the card from bulk rare to $2.50. Melira Pod is very strong in the metagame but does not dominate which will help it avoid the ban hammer. In the most recent GP in Minneapolis there were two Melira Pod decks in the Top 8 and a total of five in the Top 16. So long as the deck continues to show such strong results I expect this card to continue to grow in value. The scrylands from Journey Into Nyx will have the lowest supply of any of the scrylands. Journey is a third set so far less will be opened in drafts and sealed pools. Drafters will also be treated to Conspiracy in a couple weeks. It will be interesting to see how this effects Theros block drafts. Even before Journey the Golgari Dredge deck has been turning heads as a fun alternative to Esper Control or variations on Blue Devotion. In block Temple of Malady is also played in BUG Control and Jund. This will see the highest prices of any of the scrylands. The big question is what dual lands will be available in M15 or the fall set. I see the potential for these to continue to grow to $10 or to fall back down to around $5. I think growth is more likely. I would happily trade for them but don’t go crazy. A couple play sets should do you. Vintage Masters is the talk of the town. Magic Online will have a draftable set that allows them to play with broken cards that banned in every format but Vintage and casual kitchen tops. More people will get to experience playing with this card. It is difficult to reprint. Wizards of the Coast has banned this in Legacy so it goes without saying that they do not want to see this in Modern or Standard. Planechase, Archenemy and Commander products are all usually multicolor decks that would not play well with the greedy mana cost that Necropotence demands. It has already been printed in a From the Vaults product so I don’t think any more will appear until they are announced as a promo. This is a solid investment that I believe will continue to rise in the short and long term. Vintage Masters will not be redeemable but it will increase interest. I would trade for them. Shivan Reef is used in Modern Izzet decks like Storm or Kiki Twin. It helps fix mana without losing tempo. The UR Storm deck has been getting 3-1s on Modern MODO dailies and has been piloted by pros like Jon Finkel. The deck runs three Reefs to help fix mana but they are not essential to the deck. Steam Vents, Cascade Bluffs and Scalding Tarns all work to help the mana flow. A deck like Storm requires finesse and skill to pilot. A lot of people are trying to build it because it is relatively light on the budget and powerful. I think that this card will continue to increase in value slowly but with three printings I think it will have difficulty getting much higher than ten dollars. Urza’s Miter is a rare from Antiquities and is on the reserved list. There will never be any more copies of the Miter than there currently are. It is not that powerful or interesting so I don’t think the Magic world at large would miss it if every copy in existence suddenly disappeared. It is lower in power level than Viridian Revel which does not require three mana for every activation. It looks at your artifacts but cannot benefit you if you sacrificed the artifact. It is clunky and tough to build around. It has seen a sudden surge in popularity. It jumped from $2.50 to $4 and right back down to $2.50. It is currently making its way back to $5. There is no real justification for this outside of someone buying the cheap copies to artificially raise the price. This is still a bad spec. That does not mean that there is no opportunity here. If anyone has one they are probably not aware of the inexplicable price increase. One store on MTGPrice has a buylist of $2.51 on it. You could trade this straight for cash. I would do so before this vendor corrects its buylist. This just baffles me. There has never been a format where this card was legal and it was not one of the best removal spells played. It is always seen as a play set for the sole reason that you cannot play forty of them in your deck. This card belongs in almost every Modern and Legacy deck that has access to red mana. It belongs in every Cube and many casual decks. I don’t need to defend Lightning Bolt. I just need to point out that this is probably the cheapest you will see this premium version. I mentioned before that everyone has been going crazy for Commanders. She had been steadily growing from $4 to $7 when people starting noticing generals disappearing. There were several buyouts and she got all the way to $14 before everyone decided she was good but maybe not that good. She has taken a little dive but I expect her to level out around $10 and continue slowly growing. I would watch for the opportunity to grab her when she does. She even sees play in BUG Nic Fit in Legacy. The deck has not posted serious results but if someone can find a way to use it then expect her to shoot up along with the rest of the deck. Reviewing the deck made me realize that Thragtusk is now sitting at under $2.50. I think that is a steal. I believe his price will go up if he gets reprinted in a core set and everyone needs their play sets to play with again. I just hope they do not reprint Restoration Angel in that Standard environment. The gods have lost some of their luster. I would use this as a chance to get them. Once Return to Ravnica rotates there will be a shakeup in decks. A card that can guarantee card advantage will be well positioned. The casual and commander crowds will make sure that these insanely efficient creatures never dip down too low. I look at Karametra as the floor. I don’t think any god should ever be less than $3. I am waiting for something in Huey or M15 to come out that will make her outstanding. Ephara actually sees play in competitive Standard decks so she should not get lower than $5. If you want to play with her get in now. Standard is diversifying. Domri Rade is being used in variants on Jund, Naya and Gruul decks. It is also being used in Modern in Zoo. It is a shame that all of those decks are failing to make impressive results. His price is slipping. You can even find him for almost $15 in some locations. I would trade mine away unless you want to play with him. The fact that he is used in Modern means his price won’t drop too much come rotation, but it will be a bumpy ride until then. Liquidate now and pick it up right after rotation if you want to use him in Modern. I still love this card. It is used in a number of Legacy decks that are getting results. If we just look at the most recent SCG Open we see the following decks that feature three to four Petals. ANT and Imperial Painter were both in the Top 8. Belcher represented two spots in the Top 16. Any way you slice it a quarter of the decks that were placing ran almost the full compliment of the artifact. There is no way it stays this low for too much longer.